This morning I was having quite a troublesome morning waiting for delivery men that hadn’t quite got out of bed in time to deliver my printing. I found myself searching through my emails whiling away the time as I began to clench my teeth in frustration. I stumbled upon an email that had arrived via my website from Sian Clifford of Fluid Creative. Her request was that of a review, she’d visited the website and was impressed with my work. 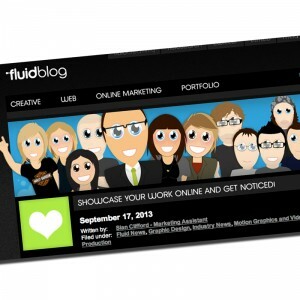 Humbled by the polite email and the compliments on my work I was happy to accept the review on the Fluid Creative blog. An introvert at heart, my website is where I feel at ease to show off. No one can study you, but everyone can look at what you do best. Compliments from a Creative Studio is still after 10 plus years illustrating very amusing and surprising to say the least. Looking at Fluid Creatives portfolio and blog further demonstrates a wide range of work from all aspects of design, web development and SEO experts. Simply fantastic work and something with which I wish I had known about over a year ago whilst I was struggling to get a company to actually be able to speak in my language….that being design. I’m definitely going to keep them in mind for future reference. With that I went back to waiting and watching for the non-existent delivery guy. Tut tut. What has happened to being able to tell the time? Definitely a new project in the pipeline and thinking about it, educational areas to look at.